Clothing/Jewelry Description A white blouse and blue pants. Distinguishing Characteristics Caucasian female. Brown hair, brown eyes. DonaMae's name may be given as "Dona Mae Bayerl." She wears eyeglasses with dark brown frames. 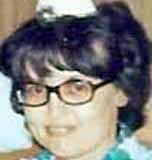 DonaMae was last seen at her home on Fennimore Lane in Muskego, Wisconsin on May 6, 1979. Her husband, John H. Bayerl, stated they had an argument and she left in the family car to cool off. When she had not returned by 10:20 p.m., he went to bed. About an hour later, John was awakened by the sound of a car pulling into the garage and a door slamming downstairs, and then the sound of someone moving around inside the house. He thought DonaMae had come home. He then heard a car turn around in the gravel lot across the street and drive slowly away. When DonaMae didn't come to bed, John came downstairs to look for her and found the car in the garage. The garage door was open and the drift pin that normally held the door shut was missing and it has never been found. and the garage door open. There was no sign of DonaMae and her clothes were left behind. She has never been heard from again. John reported her missing three days later. He told the police she had taken $200 in cash, that there were problems in their marriage, and that he wasn't concerned by her absence. However, DonaMae's family didn't believe she would have left on her own without the couple's two daughters, whom she was devoted to, and they reported their concerns to the police. After DonaMae's disappearance, John behaved suspiciously: he refused to say what they had been arguing about that night and he did all the laundry, something he had never done before, even when DonaMae was too sick to do it herself. After he was done washing them, a quilt and a rug still had stains on them. John acted unconcerned about his wife and even went bowling right after her disappearance. He didn't even tell his coworkers DonaMae was missing, and he acted as if DonaMae wasn't going to come back. He stated that on the day DonaMae went missing, the family had gone out shopping and to dinner, something the children contradicted. The couple's daughters said they hadn't gone shopping or had dinner out that day. They stated their parents had been fighting all day and that their mother had been sick. They had last seen her when she put them to bed. DonaMae's sister came to stay at the house and take care of the children in her absence, and found bloodstains on the wall inside the garage and on a bottle inside the family vehicle. There was evidence of a struggle, including items knocked over. The police began to suspect foul play after the bloodstains were discovered. 1970s forensics didn't allow for DNA testing, but authorities determined the blood was DonaMae's type and not John's. He said didn't know how it got there. Although DonaMae had been an independent person with a career, after she married John she became very dependent on him. She stopped working, and John didn't allow her to have much money. She had only one close friend, a woman who lived in Michigan. DonaMae wrote 35 to 40 letters a year to this woman. In the letters, she confided that her husband physically abused her and that he had once thrown her down the basement stairs. DonaMae stated John had asked her to sign a document promising that he would become the sole owner of their house if she died, but she refused to sign it. Her friend offered her $500 in cash if she wanted to leave her husband. John admitted that he had struck DonaMae on multiple occasions, and that he had been having an affair for two years prior to her disappearance. He had also abused his first wife, who divorced him on grounds of "cruel and inhuman treatment" after two years of marriage. Three months after DonaMae was last seen, John filed for divorce. He subsequently remarried and went on to abuse other women he had relationships with. In interviews with police, he said he thought something bad must have happened to DonaMae because she would not have abandoned her children, and he admitted he had been a bad husband. A photo of John is posted with this case summary. In February 2019, he was arrested in Florida, where he lived at the time, and charged with first-degree murder in DonaMae's case. Authorities stated the case was mainly a circumstantial one, and one of the key pieces of evidence was a recorded phone conversation John had with his and DonaMae's youngest daughter in 2009. John stated: "Something happened and I, it, I, I’m sure that her heart’s not beating. Because if it was, she would have found her way back, whatever. You know what I mean? I don’t think she’s alive." Foul play is suspected in DonaMae's case due to the circumstances involved. Her husband has been extradited to Wisconsin and is awaiting trial in her presumed murder. Updated 7 times since October 12, 2004. Last updated February 23, 2019; details of disappearance updated.